Strawberries require full sun and well-drained soils. We do not grow strawberries from seed. We always buy seedlings from the garden center or via mail-order. Avoid sites in that fist year where tomatoes, potatoes, and peppers have been grown in the last three years to reduce the risk of root disease problems. If you use Actinovate when you plant those problems disappear. Depending on whether you choose June bearing plants or the everbearing types, you will set your plants in the garden in two different designs or plans. This is the best system for growing day-neutral and everbearing strawberries. In this system all the runners are removed if there any so only the original mother plant remains. Removing the runners causes the mother plant to develop more crowns and flower stalks. Plants are set about one foot apart in rows in all directions as when you are planting a raised bed. This system is a bit more labor intensive but it is our favorite for the June bearing strawberries. An advantage to the system it that it produces fruit the first year which is what we all want. At planting space the individual plants at 4 inches apart in rows; multiple rows should be at least 24 inches apart. Do not remove the flowers, and clip all runners. This management system is very productive and results in large berries. Continue cutting off the runners and harvesting berries for about three years or until productivity declines. One technique is to plant new seedlings every year after the second year replacing the older mother plants. Early spring (late March and April) is the best time to plant strawberries. Remove the strawberry plants from storage when ready to plant. Trim off the older leaves, place the roots in water with some kelp extract for an hour, then plant immediately. 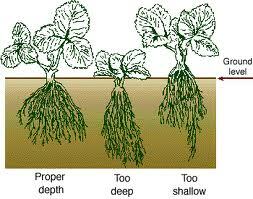 Set each plant in the ground so the crown of the plant is even with the soil surface. Immediately after planting, water the strawberry plants well and apply an organic liquid fertilizer to aid in the plant’s establishment. Apply 1 or 2 cups to each plant.